I received a Cathay Collection porcelain doll when my grandmother passed away. It's number 1400 of the 1-5000 collection. There is an engraving on the neck that has the letters NISI. Just curious to know how much it may be worth. Can you tell me her size? Is she 16 inches? Is the hair red or blonde? Also, do you know her name...meaning is she one of the fairy series...box, papers, certificate of authenticity? 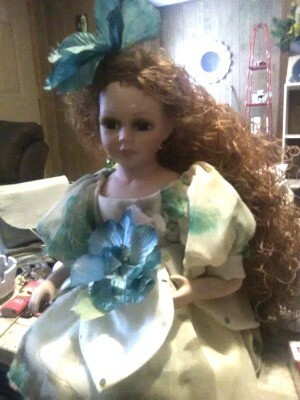 There are lots of similar dolls but I would need the additional info to give you a good estimate. As a series of 5,000 while limited, there is often more supply than demand which drives prices down. Some still have high demand, which keeps prices up. Just wanted to be sure I am getting you an apples to apples estimate. Also, was she played with? Original clothes? Does she have any flaws? Condition matters a lot with dolls. I would like to help with more info! This is a mass-produced doll. There are 5000 of them. It is worth $25 or even less. I would do a search on "Google" putting all the info. you have. Or check on eBay to see if your doll is listed for sale to get a general idea on how much it is worth.